Jesse has her master’s degree in Occupational Therapy and minor in special education from the University of Mary in Bismarck.Jesse has occupational therapy experience in outpatient pediatrics, inpatient from neonates to geriatrics, and school based therapy. 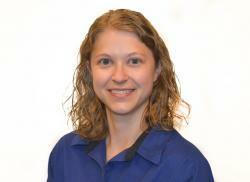 Her interests include pediatric feeding, sensory integration and development across the entire lifespan. Jesse is a Certified Lactation Counselor, is certified in SOS Approach to Feeding, Handwriting without Tears, and Plagiocephaly and Torticollis.